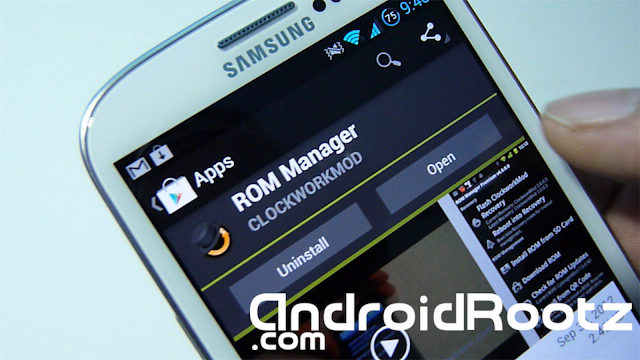 How to Install ClockworkMod on any Galaxy S3! [No Computer] [ATT, T-Mobile, i9300, Verizon] ~ AndroidRootz.com | Source for Android Rooting, ROMS, Tricks and More! You MUST already be rooted! Click here on how to root Galaxy S3 on Mac! If you used my Windows guide then you already have ClockworkMod Recovery installed on your phone. This guide will work for ANY Galaxy S3. 1. Download ROM Manager from the Google Play Store. 2. Open up the app and select "Flash Recovery". 3. Select the correct recovery for your phone. 4. Once you get notified that ClockworkMod Recovery is done, your finished. 5. You can enter into ClockworkMod Recovery mode manually or using the ROM Manger app.